Zweihänder Kickstarter has been funded! Amazing job fellow gamers! 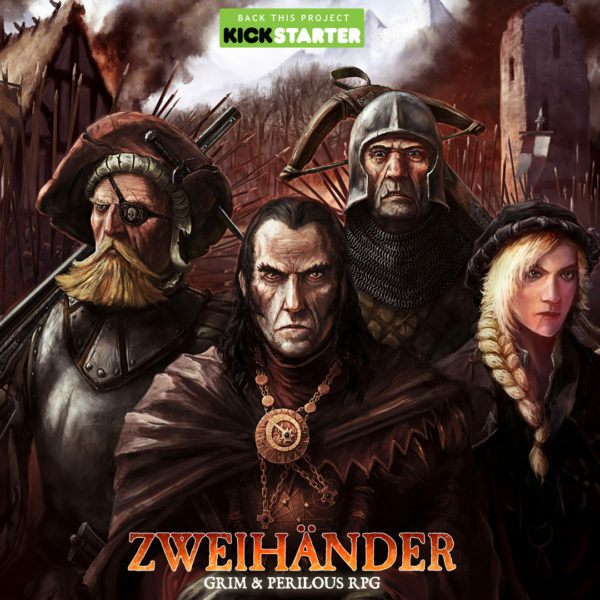 Zwehänder was funded in six hours and now we just keep digging for more rewards! I was away from computer when this thing went live but here is the announcement anyway! Yay! ZWEIHÄNDER fans! We are now officially live on Kickstarter! Thanks to each and every one of you for your interest, support and shared over these long years as we prepared the game for the public. We know you’ll enjoy ZWEIHÄNDER Grim & Perilous RPG as much as we do, and hope to count on your support to bring a cool new indie tabletop RPG to market! Happy gaming, and we’ll see you over at Kickstarter! ZWEIHÄNDER fans! We have long stated that we refuse to go to Kickstarter until we had thoroughly play-tested final version of the rules. After 4 years, 8 months and 12 days, we are proud to announce that the final draft for ZWEIHÄNDER Grim & Perilous RPG is complete! ZWEIHÄNDER Grim & Perilous RPG will be the first of its kind to market: an inspired version of Warhammer Fantasy Roleplay, adaptable for any “grim & perilous” campaign set in the familiar Old World, the politically-inspired intrigues of George R.R. Martin’s A Song Of Ice and Fire, the racial tensions of Andrzej Sapkowski’s The Witcher, the criminal underworld of Scott Lynch’s Lies of Locke Lamora, the war-torn adventures set in Glen Cook’s The Black Company and other Renaissance-inspired adventures. Thoroughly play-tested by our internal team across nearly 240 game sessions and three major revisions, we are gearing up to bring it to the public by way of Kickstarter. We intend to use Kickstarter to help raise additional funds for artwork, editing and layout, along with providing you a way to get your hands on a Day One PDF release of the rules! Additionally, we’ll use Kickstarter to help drive pre-orders for print-on-demand softcover and hardcover options with our partners at Lulu.com. We’re aiming for a tentative Kickstarter launch date of July 25th. We are counting on your support to help bring this book to publication. Keep your eyes peeled, and if you haven’t already, please go over to our Facebook page and LIKE it! You can also head over to our forum at Strike to Stun to tell us what you’d like to see in our Kickstarter. In celebration, we’re releasing a massive 45 page unedited preview of Chapter 10: Grimoire to you. This includes a full narrative and mechanical overview of how Magick works in ZWEIHÄNDER Grim & Perilous RPG. You can also peek at a full list of Generalist Petty Magicks, alongside Prayers of the God-Emperor, the Arcana of Pyromancy and their related Elite Professions. Finally, this preview also includes two new Rituals and mechanics for using mysterious Wytchstone to aid in casting spells. Download the magick preview here! 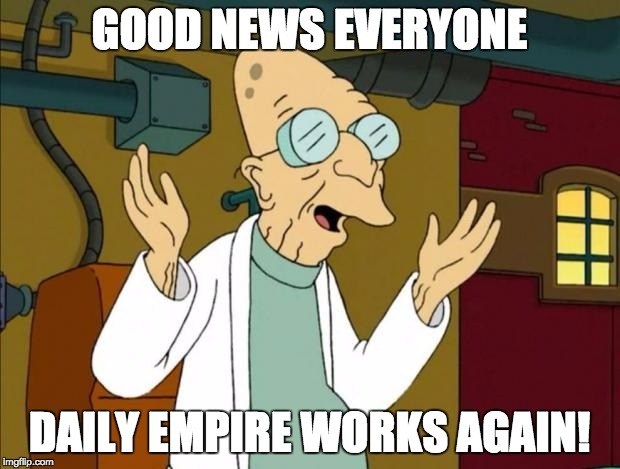 As some of you might have noticed the Daily Empire has gone under indefinite hiatus. At the end of 2015 our gaming guild (Guild Redemund) decided to change our domain provider. During the migration something happened to all WordPress sites that broke visual editing, uploads and links. During this spring I tried to fix it and contacted our main admin so that he could do something about it. Unfortunately nothing has helped. At the moment I have to admit defeat and declare this blog closed or at least in an indefinite hiatus. All is not lost though. The Daily Empire will stay online as long as I have any say in this. And who knows? Maybe we get it working some day. As of now I can only apologize for this inconvenience! My most sincere apology goes to Emil Heide who has been patiently waiting for me to fix this site so I could upload his newest work. “The show begins with The Enemy Within Revisited. 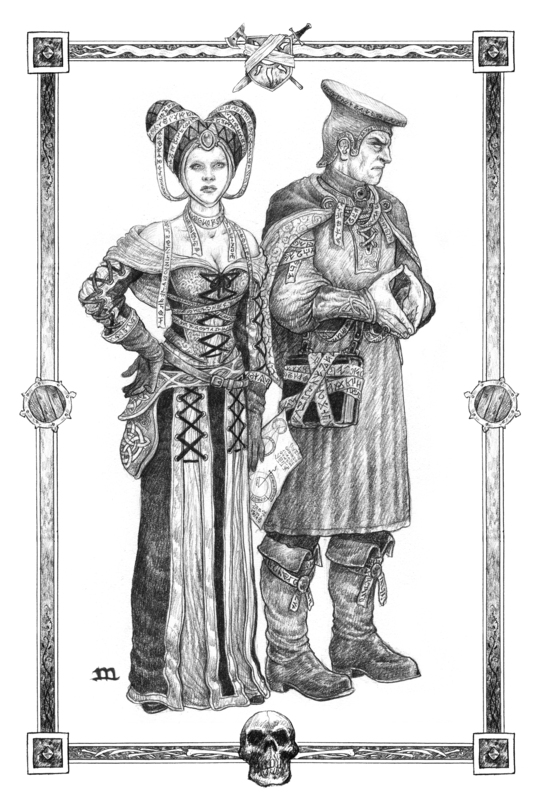 The classic WFRP 1st edition campaign gets a revisit from our team using 3rd edition rules. What started out as a personal wish to record our sessions has become a fully fledged podcast and I’m really excited about it and hope you are too. be able to share our adventures with other Warhammer Fantasy Roleplay fans and RPG fans in general. And let’s face it there’s precious little else out there at the moment to satiate your WFRP hunger. So go and subscribe to stay tuned to The Enemy Within Revisited! Also: I’m still having some issues with the functionality of this site and cannot upload new files. I’ll try to get it fixed but my time is quite limited at the moment.